There are a lot of old wives' tales about roses and rose culture. Some seem to have merit, others don't. During our Exhibitors Rose Trip IV, we started a list of what we called rose myths or mistruths. We have found rosarians around the United States disproved many of these oldtales, some of which are very basic and covered in every rose culture book. One of the first myths is we have to cut or deadhead roses at a 45 degree angle away from the budeye. Now allegedly the "sap" from roses will seep over the budeye and kill it or stop it from growing. This is false. First off, how often do you see rose sap oozing from a wound on a freshly cut cane? Almost never. Rose canes are porous and very pithy, which holds onto water. Since the rose isn't a true hardwood plant, there is no sap per se, at least the way we think of tree sap, such as with pines and maples. Even if it did, it would not hurt the budeye at all. Think about it. Why would sap hurt a budeye when many of the roses shipped around the United States, especially the northern climates, are dipped in wax? If wax can't kill a budeye, it is doubtful sap would. Now it is true that if you prune high above a budeye, then that section of the cane will die back to the budeye. So always cut just above a budeye, it just doesn't matter if it is flush or at an angle. Next would be the myth that you have to cut back all your roses in the summer time, aka summer pruning. Frances Ballentine of South Carolina disproved this myth. And what she said makes sense. Roses transpire gases and water through leaf pores called stomata. This helps cool down the plant. If you remove all the foliage, then the rose is left to the harsh environment unprotected, which means 110+ degree weather in some areas. You know this cannot be good for the rose, similar to not winter protecting at all up north. So the more foliage, the more the plant has a chance to cool down during high heat. Similar to this is the myth of having to cut back to a five-leaflet leaf, especially during the summertime. Exhibitors have shown that roses do fine if you simply remove the spent bloom at the base of the peduncle, just above the bracts. This gives more foliage for cooling. 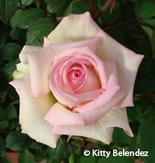 During rose show season you would cut back to a strong budeye, and not likely down to the first five-leaflet leaf. All rose books say you must prune during the winter. Do you really need to prune your roses at all? Not really. My favorite saying is roses will survive despite us. I think pruning does help the plant with a good start coming off dormancy, whatever little we get of it here in our area, and for aesthetics it is good. But what if you never prune at all or never got around to it? Will the plant die? No, it will survive and grow on. We still suggest getting rid of dead wood and diseased parts. The next myth is pruning related as well. How often do books and references mention sealing the end of the rose canes with white glue or orange shellac after winter pruning? Now here in California we prune in January, which is too cold for the insect, the Raspberry Cane Borer, to be active let alone lay its egg on the cane tip. The holes at the end of the rose canes are the result of the borer larva burrowing down into the cane before it pupates and turns into an adult. If, and I mean IF we even have these borers in our climate, then they would not be active during this time of the year. They are more likely to be active during the spring and summer when the berries they prefer are growing. So it is a waste to seal the cane ends here, and I doubt you would seal each and every rose that you cut off of a plant the rest of the year. Plus, the damage is not lethal to the plant. This may not be the case in other areas of the United States when the borer is active and they prune in the spring. Another myth concerns Epsom salts, aka magnesium sulfate, which claims will help create basal breaks. I don't know about you, but I do feed Epsom salts to my roses. But will they really help create basal breaks? This issue has been out to the jury for several years. Part of the basis for this myth is that if a soil is devoid of magnesium, then they will not produce basal breaks (new canes). Now if a plant has plenty of magnesium, which most of our soils have an abundance, will it help produce more basals? I doubt it. I have several roses that refuse to put out new basals, like 'Sheer Elegance'. It doesn't matter how much I feed it, fertilizer or Epsom salts, it will not produce basals. I think basal production is part of the genetic makeup of the variety. I also believe that basal production happens when the plant is happy, well fed and maintained, much more so than feeding them Epsom salts. I have several roses that are budded that keep kicking out new basals because they are healthy, and I never feed them Epsom salts, they get organic fertilizers, nothing extra. Not very scientific I know. But I have yet to see any research that says you can produce more if you give excess magnesium. I have to admit, even though Epsom salts are not real cheap, $18/50# bag, I will continue to add it to my fertilizer mix because some Epsom salts will not hurt the rose or affect other processes, just in case I am proven wrong. Another so-called myth is that feeding with zinc will produce longer stems. The same applies as above with Epsom Salts. A deficiency will be short stems, but will an excess produce longer stems? I have tested this on several roses and have found no difference in stem length. However, I did find more cases of vegetative centers than ever before. Granular systemics that are fertilizers and a pesticide in one are not high on my list for several reasons. The first is the high toxicity of the base pesticide, disulfoton, which will kill animals, birds, and anything else ingesting it. It is a hazard in my book. Next, I am not sure they are all that effective. Systemics are fine for small, short growing plants, but for tall growers, the heaviness of the material most likely will not travel to the very end of the long canes, and that is where all the bugs love to feast, on the new tender growth. Plus, I think plants are stunted somewhat and not as healthy Rose Myths as ones grown without the systemic. There is some talk that they are doing away with this material, which will be a big boost to rosarians and the environment alike. One of the common myths is when books show a person planting a rose and stomping on the freshly returned soil. Now how much sense does this make to you? We carefully dig the hole for the plant, making sure the returned soil has plenty of organic material to loosen it up and have good drainage and air spaces, and then we stomp on it to compact it? Makes no sense at all. The best way to remove large air pockets is by filling the well with water and letting the water move the soil. Another myth is that organics are better for roses. Simply put, a rose has no idea, nor cares, if the nutrients that it gets are organic or not. They cannot differentiate between them. Now some fertilizers are better than others. High NPK fertilizers can damage or burn the rose feeder roots, or produce high levels of salts. Organics are much lower in NPK levels and release nutrients slower than the normally faster acting chemical types. Care needs to be taken for some organics as well, such as steer manure which can be high in salt concentrations, and fresh manures which can have a high urea content that will burn the rose. I know of one rosarian who killed all of his roses by pouring on straight fish emulsion without diluting with water. But whatever form the nutrient is in, it has to be converted into a form that is available for uptake by the plant, and then the plant often converts it to a usable form for its internal processes. The conversion to a usable form can be slow or fast and often depends on soil organisms. For example, nitrogen is taken up by the roots as the nitrate ion, and converted inside the plant to the nitrite ion for use. Ammonium nitrate is fast to convert to a usable form while urea is very slow. The rose cannot tell where the nitrate ion came from, organic or an inorganic source, all it cares is that the nutrient is available for uptake. Don't get me wrong, there is a place for both in all feeding programs. I like to use a lot of organics on roses as they are slow release fertilizers and in low concentrations of nutrients. Often the rose needs a quick pick-me-up and inorganics are better in some cases, and some organics, like blood meal, are fast acting. Next is why anyone would want to buy expensive fertilizers for roses? Another one of my favorite sayings is the best fertilizer for roses is whatever is on sale. This is true, except stay away from high NPK concentration fertilizers such as lawn food. Fertilizers that are 20-20-20 and above, you can use once or twice a year but should not be used weekly as it will cause vegetative blooms. It is better to use a fertilizer lower on the first number (nitrogen) and higher on the second number (phosphorus). The next myth has most references telling you to soak all your roses in Vitamin B1 to help the rose get off to a good start. This is one I have always had a problem trying to decide if it helps or not. Vitamin B1 is a material that helps prevent transplant shock in many plants. When we soak a bareroot rose, the rose is dormant, in other words, it isn't growing at this time. So does B1 really help your roses grow? I have found no references to support this myth. Now there is proof that B1 will help growth of mycorrhizae in the soil, and maybe with the combination of the two it can help the rose in the long run. But during the winter, mycorrhizae is not real active, so it is doubtful that B1 really does help. Now if you use a solution of a root stimulator, such as naphthalene acetic acid (NAA), then you have a better argument. Vitamin B1 is very cheap, so what harm will it do if we use it, just in case we are wrong? How often are we told, and I recall a top rosarian stating this when I first joined a local rose society, to dig a big and deep hole to plant roses? He said to dig a hole 3 feet wide and 3 feet deep. This is overkill. Even though you do not want to put a $10 rose in a 25 cent hole, there is a limit on what is acceptable. I can see digging a very deep hole if you have major drainage problems. But in most of our cases, digging a hole that deep only affects our backs. The truth is that roses only grow in the top 12-18 inches of the soil. Anything deeper than that is not necessary. Also, the rose roots only grow out as wide as the plant generally. So digging a wider hole and not so deep is best for the rose. I dig a hole about 2 shovelfuls down and 3-4 wide. Another rose myth is to never put any nutrient in the planting hole that you dug for the rose. This is bunk. 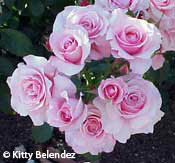 Roses need a good start and some nutrients are very slow moving in the soil, like phosphorous. Phosphorous moves about an inch a year through good soils. So it makes plenty of sense to place nutrients that are slow moving in the hole the rose is planted in. I use a handful of superphosphate or bone meal per rose hole. Another myth is that roses do best in a pH of 6.0 6.5. This would be the optimum pH for nutrient availability. However, roses will not suffer at other pH levels. As a matter of fact, a top rose exhibitor back east has a soil of 5.1-5.3. Yet he grows some of the best roses around. I find roses do much better in an acidic soil than basic. I think the ideal range for roses should be 5-7 pH. How many people have added lime to the soil to get from 5 to 6, when it wasn't necessary? Speaking of pH, how many rose books show the cheap pH meters that you simply stick into the ground? Those are based on conductivity and needs moisture in the ground to work. They are also terribly inaccurate. Use a pH meter, test lab, or swimming pool pH test for the best results. One rose myth that was disproved by my rose buddy John Mattia was that if you damage the crown of the rose, suckers will form from that spot. In his excellent article on suckers in the 2000 ARS Rose Annual, John showed this is not the case. On the old garden and shrub rose side, it is a myth that hybrid musks are from 'Rosa moschata' breeding and they have the "musk" scent. The truth is that hybrid musks are actually hybrids of 'Rosa multiflora' and the musk scent is actually from multiflora. One of the oldest rose myths was that 'La France' was the first hybrid tea. It wasn't. 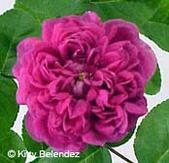 There were many roses of similar class breeding that existed long before 'La France'. The Royal National Rose Society of England declared that 'La France' was the first hybrid tea in the early 1900s and it has stuck with us ever since. Another myth is that roses have thorns. This is incorrect. Roses actually have prickles. The difference is prickles sit on the upper layers of the stem and snap off easily. Thorns come from layers beneath the outer cane layer and do not snap off easily, they tend to break or not come off at all. Another myth is that roses have always been known as the Queen of Flowers. This is also incorrect. Before the famous poem by Sappho proclaiming roses as the Queen of all Flowers, roses were considered the King of Flowers. Now we have evidence from Peter Harkness of England that Sappho never inked those famous lines. These lines may have come from Tatius, circa 180 AD. Speaking about poems. It is known that Gertrude Stein wrote the immortal lines "A rose is a rose is a rose." But she wrote this apparently in disgust about all the prose about roses, and is just stating that nothing is special about roses. Downy mildew is a serious rose disease. People feel the disease came from other roses or their neighbors. Not so, at least initially. The roses you purchase are grown in an area heavily infected with downy mildew. The disease is in all bareroot roses, sitting idle to start growing when the conditions are right. Downy likes warm days, cool nights and high humidity to grow. The same applies to spring dwarf virus, which is only seen in early spring. Along the same vein, is a myth that mosaic virus is transmitted from one plant to the other because they are planted nearby, or by using pruners that you cut an infected plant. There is no truth to this, unless the roots of one plant fuse with another. But very unlikely. Using infected budwood or rootstock transmits mosaic virus. One of my favorite myths is the constantly reported "fact" that roses are difficult to grow. Says who? Now I agree if you are an exhibitor, and the best roses for showing needs constant spraying, but who can say roses are hard to grow or difficult when you see old stands of roses blooming beautifully with total neglect. Roses are only as hard as you want them to be. If you grow good stock of fairly disease resistant varieties, they are carefree. I always said that roses survive despite us. How many other plants can you say that about? My 'Lady Banks' blooms beautifully each year, and I do absolutely nothing to it. No feeding, pruning, nothing. Yet it has thrived over 15 years in the same spot. The Royal National Rose Society of England is the oldest rose society in the world and at one time was "the" society. In 1967, they boasted a membership of over 106,000 members. No longer, they are a shell of their former selves, with just over 10,000 members, smaller than the American Rose Society. Several reasons can be postulated for the decline, but as with the ARS, we need youth to survive, and if we don't change our old ways, we will likely perish as well. Another rose myth deals with species roses and hybrids. All roses derived from species roses are hybrids. So the class of hybrid teas really should be hybrid hybrid teas. There in only one true rose class, and that is species roses that were growing naturally in the wild. Now experts will disagree about the double, or plena, form of species roses saying they cannot survive in the wild, as insects cannot pollinate them. That is a story for another article. Older rose myths included some interesting items. One myth said that all budded roses had to be planted with the bud union facing north. Of course roses and all plants will grow toward the sun so it doesn't matter what direction the rose is planted. DDT was once touted as the best thing since sliced bread and very safe. Yeah right.